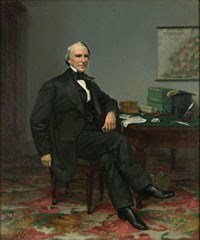 Wyndham Robertson was the Acting Governor of the U.S. state of Virginia from 1836 to 1837. He also served twice in the Virginia House of Delegates, the second time during the American Civil War. Robertson was a Whig, and was an advocate for Union during the secession crisis that precipitated the Civil War. However, after Lincoln's call for troops, he advocated secession. After the war, he was a member of the Committee of Nine that helped usher Virginia back into the Union. Robertson, a descendant of Pocahontas, published a book near the end of his life in her defense, and tracing her ancestry and descendants.